The weather may have felt like September but it was championship time on Nov. 25 when Blue Valley North squared off with Derby in the Kansas 6A State Championship at Emporia State University. The Mustangs outlasted the Panthers 49-42 for the first football title in school history. It looked like it was going to be a long day for North as Derby needed only five plays to take the lead. A quick three and out saw the ball right back with the Panthers. The Mustangs would go on to score touchdowns on seven of their next nine possessions. While some of his teammates may been nervous on the championship stage, junior quarterback Graham Mertz has been here before. Mertz went 24 of 30 passing for 462 yards and four touchdowns. If that wasn’t enough he added a 15-yard rushing touchdown as well. In a game with gaudy offensive numbers, two of the biggest plays were made by the Blue Valley North Defense. Late in the third quarter Derby was knocking on the door. Hunter Igo looked to his left and seemed to have an open receiver in the end zone. North safety DreSchaun McCallop got in the passing lane and tipped the ball. The senior then had the presence of mind to find the ball and snag it just before it hit the ground. North sealed the game with an interception in the dying seconds as well. The biggest call of the day came just over two minutes left. The Mustangs found themselves out of field goal range facing a 4th and 12. The call Sims is referring to is a crucial defensive pass interference call that saw the Derby defender fall down in front of the wide receiver. There was contact and the ref threw his flag immediately. The resulting first down kept the drive alive and the Mustangs scored four plays later to take the lead for good. 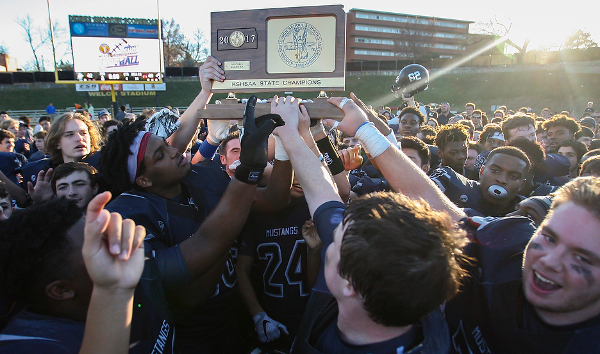 After the game Sims reflected on what the win means for Blue Valley North.